Irving Rosenfeld (Bale) is a small time con artist who dreams of bigger things. He is searching for a soul mate and believes he has found one when he meets fellow con artist Sydney Prosser (Adams). Their relationship is passionate and fulfilling. The one flaw in this perfect scenario is that Irving is married to Rosalyn (Lawrence) and he feels an obligation to his adopted son. Irving is a con man with the soul of a poet. Or so he believes. We are given to understand that he and Sydney are connected in some higher way through their cons. They’re not scummy grifters, they put the ‘art’ into con artist. Their affair and their business is put under strain when they become entangled with Richie De Maso (Cooper) a man with an overwhelming, yet mistaken faith in his own abilities. Meeting Richie causes massive problems for the normally publicity-shy Sydney and Irving. They begin work on a big scam that has a public face. The con escalates and draws in more and more players. Director David O. Russell’s AMERICAN HUSTLE is an entertaining movie that most audiences will enjoy during its rambling 138 minute length. Despite being based on the FBI’s notorious Abscam operation of the late 1970s, the story does not bear deep scrutiny. This is not a movie about the minutiae of a scam, nor of its takedown. The movie is a loose study of some broad, desperate characters. It delivers laughs and emotion through Russell’s vision of the 1970s. To quote THE CASTLE, “It’s the vibe of the thing”. Russell has gone to great lengths to make his movie feel authentic; the retro hair, wardrobe and production design are all top notch. There are lashings of era-appropriate rock and pop on the soundtrack. The script name-checks the icons and obsessions of the time. The Watergate scandal is recent history and it affects the thinking of these characters. 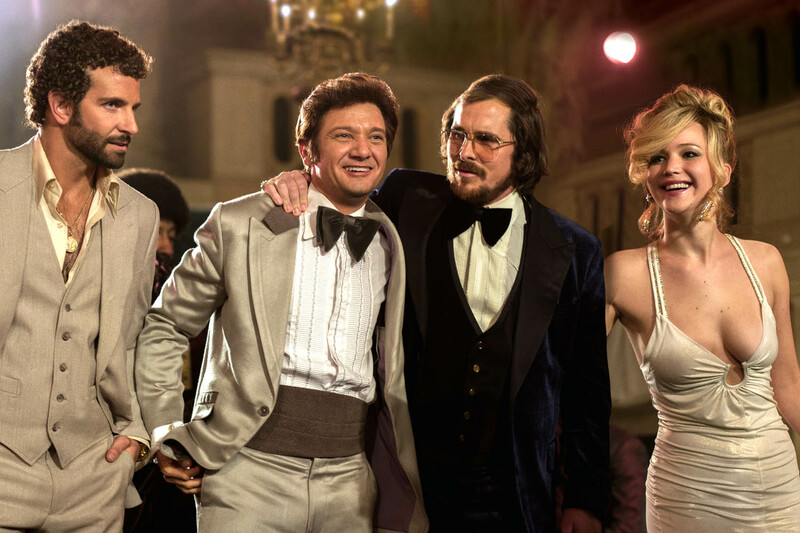 AMERICAN HUSTLE is a high-wire act of a movie. In this respect, it is a little like the Coen brothers’ BURN AFTER READING (2008) in that it also has an excellent cast giving outsized but engaging performances that distract us from a preposterous story. Its actual influences seem to be GOODFELLAS (1990) and BOOGIE NIGHTS (1997). I enjoyed the movie for its sizzle rather than any substance. Audiences in Perth Western Australia obviously love this film. Unusually, It has been playing here since its premiere more than two months ago. That sort of thing used to happen back when AMERICAN HUSTLE was set, but no longer.Only the true crowd-pleasers have this kind of staying power these days.